It’s that time again! FAT TUESDAY! today I am completing my three part series. Now you’ve got the tools to put together a sweet themed bacon bar for your next brunch… hell, let’s be real, it’s for any gathering! Here we have a variation on a classic southern “toffee”. It’s not actually toffee per se, but the way the butter and sugar kind of candy the crackers, is like white trash magic in a pan. I will refer to this as Bacon Crack, and once you’ve tasted it, you’ll know why. Preheat oven to 350. Line a standard cookie sheet with aluminum foil and spray it very well with cooking spray. Do not try to make this without using foil; you will hate yourself. Place saltine crackers in a single layer, covering the bottom of the pan. In a saucepan on the stovetop, combine butter, syrup and sugar and bring to a boil while stirring constantly. Once you’ve reached a boil, reduce the heat and simmer, uncovered, for 3 to 5 minutes or until slightly thickened. Stir frequently and avoid scorching. Once slightly thickened, remove from the heat, wait 30 seconds, add the vanilla extract and stir. Pour mixture over the prepared pan with the saltine crackers. Bake in for 5- 7 minutes, or until toffee/liquid becomes bubbly. After removing the pan from the oven, let it rest for 3 to 5 minutes. Sprinkle on the chocolate chips and crumbled bacon. Wait 3 to 5 minutes, letting the chips soften and begin to melt. 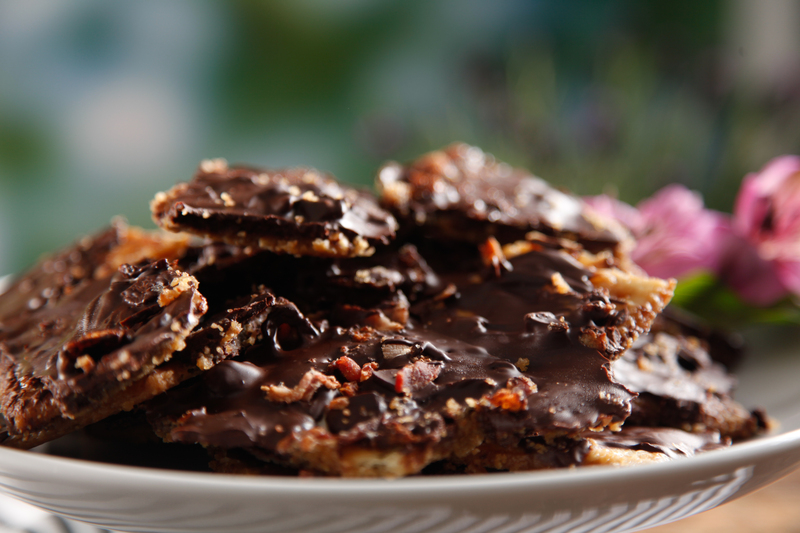 Once soft, spread chocolate and bacon evenly over crackers. Let cool until hardened. Break into pieces the size of your choice. Store in an airtight container at room temperature for up to 2 weeks or in the freezer for up to 4 months.